"Original and fascinating.... Easy to read [and] accessible." Some trees and birds are made for each other. Take, for example, the whitebark pine, a timberline tree that graces the moraines and ridgetops of the northern Rockies and the Sierra Nevada-Cascades system. This lovely five-needled pine, long-lived and rugged though it is, cannot reproduce without the help of. Clark's Nutcracker. And the nutcracker, though it captures insects in the summer and steals a bit of carrion, cannot raise its young in these alpine habitats without feeding them the nutritious seeds of the whitebark pine. Between them, these dwellers of the high mountains provide for each others' posterity, which leads biologists to label their relationship symbiotic, or mutualistic. But there is more to it than that, because in playing out their roles these partners change the landscape. The environment they create provides life's necessities to many other plants and animals. 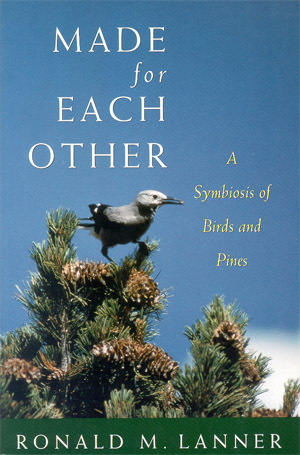 Working in concert Clark's Nutcracker and the whitebark pine build ecosystems. Ronald M. Lanner is Professor Emeritus of Forest Resources at Utah State University. He is the author of a number of books, including The Piñon Pine, Trees of the Great Basin, Autumn Leaves: A Guide to the Fall Colors of the Northwoods, and the forthcoming, The Conifers of California.